As long as you can hear the TV or see the screen out of the corner of your eye, they are not tuned out. Interestingly, TV ads can be more effective when you think they are tuned out. Tuning out is just fine with advertisers. When your conscious awareness of the ad is turned off, the door to your subconscious is left unguarded. Without a guardian, suggestions from ads go directly into your subconscious. The conscious mind is a good guardian because it is logical and critical. Conversely, the subconscious mind is illogical and accepts everything as true, even silly TV ads. So, without conscious awareness, those dumb ads go directly into your subconscious mind. In a previous blog I explained why TV ads are so effective. Now let’s look at why so many ads are child-like. The crux of a prior blog was that a large part of your decisions—decisions on what you buy, in this case—come from the subconscious mind. Because the subconscious mind is illogical, immature, and undiscriminating, decisions made by your subconscious mind are often not for your best interest. And one big problem is that you do not know what is in your subconscious mind. Your conscious mind and subconscious mind are different as Guinness ale and water. No, they are even more different than that. You are, I trust, familiar with your conscious mind, but are you familiar with your subconscious mind? Of course not; it is unconscious. Your subconscious mind evolved 10′s of millions of years ago, and it evolved to meet the needs of that time. Whereas, your conscious mind is a baby by comparison. And it evolved under different conditions. Unfortunately for us, they do not talk to each other very well, but that’s the subject of another blog. In brief, here are a few of theses differences and how they are exploited to sell products in TV ads. Visualization and Imagination. Your subconscious mind communicates with images. Images, like a strong, healthy, jolly green giant eating a certain brand of frozen vegetables imply you and your family will also grow big, strong, and healthy by eating their brand. (This is rare. This ad is suggesting something healthy.) Actors in Coke-a-Cola ads are young, active, and having fun within a group of friends. Drink Coke and you too will be popular and enjoy life. Repetition. Ad nausea. Same ads run twice during the same commercial break. This is not a mistake. If you want to impress something into your subconscious mind you need to repeat it over and over. And it does not have to be grammatically correct, mature, or logical. Symbolism. Symbols appeal to a deep level in your mind and they can be subtle. For example, actors might wear a badge, distinctive hat, or costume to connote authority. Logos are special symbols because they represent the company. Thus, companies spend a lot to make their logo well-known. Logos are often linked to famous people, notably athletes. Athletes connote strength, agility, endurance, and a health. TV ads are the perfect venue for imbedding suggestions in your unconscious mind when you are most venerable. And the producers don’t care whether the ads are foolish or irritating. In fact, these factors can work to their benefit. 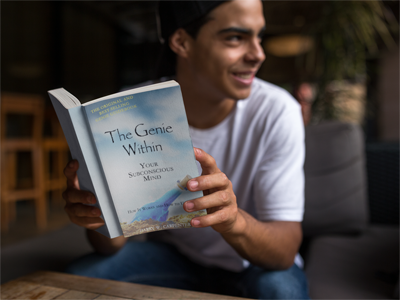 For more information on TV advertising, see pages 138-145 in The Genie Within: Your Subconscious Mind—How It Works and How to Use It.